This past week the Building Study Committee met and reviewed a plan for signage and wayfinding at FUMCFW. 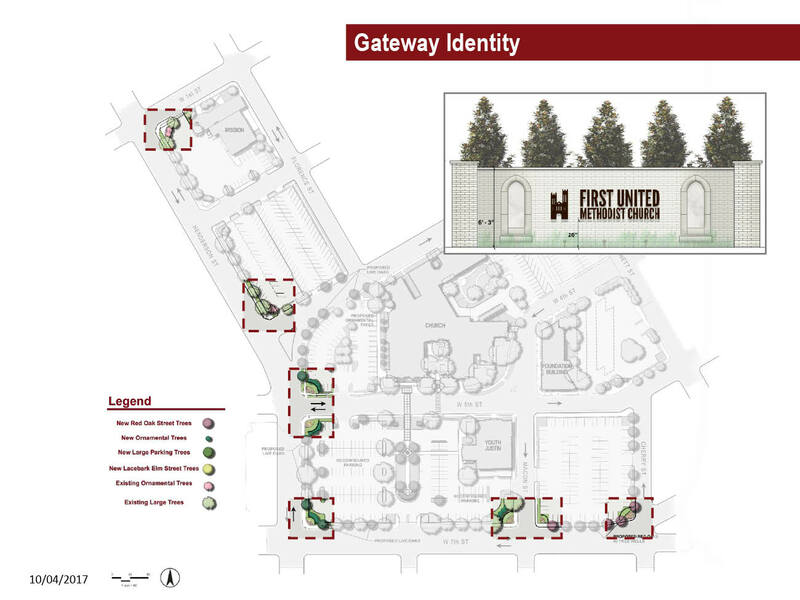 In a unanimous vote they recommended to the Board of Trustees that we move forward on developing this plan that seeks to put beautiful curved “monument” signage at the corners of our church campus to mark its edges, as well as bronze-colored permanent signage to help identify buildings and provide directions to various locations on the campus. In two subsequent unanimous votes, the Trustees approved first the recommendation of the Building Study Committee to proceed with the signage, wayfinding, and landscaping plan, which will also incorporate ornamental trees and grasses around the new “gateway” signage. 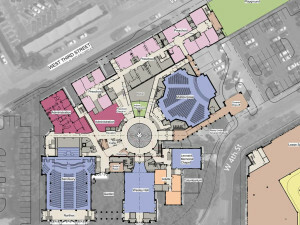 Next, the Trustees heard and approved the recommendation of the Building Study Committee that rather than beginning our building program with the parking garage as originally planned, we shift to building an additional multipurpose worship and event space, reorienting Wesley Hall, and connecting all church spaces with a large central rotunda gathering space. This decision on the parking garage comes on the heels of the departure of XTO from Downtown Fort Worth that reduced the need for additional downtown parking. 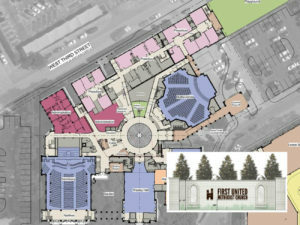 This allows the Building Study Committee and Trustees to pursue the solution to our urgent need for additional worship space due to the rapid growth of The Gathering. With this vote, the Trustees approved the Building Study Committee’s recommendation to proceed with schematic design architectural services subject to the contract being reviewed by our church attorneys. The next step of this project is to invite Rev. 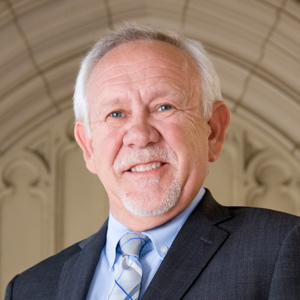 Travis Franklin, our District Superintendent, to the next Building Study Committee meeting at the end of this month to review the United Methodist Church process for moving forward. Projected timing for a capital campaign to help fund this exciting first phase is early fall 2018. Trustee Bill Scott, a contractor who has provided endless support to FUMCFW building projects large and small, commends the hardworking Building Study Committee on what he says he considers to be well-researched and thoughtful solutions: “I’m really proud of our Building Study Committee for looking at this inside and out and considering all alternatives before making this recommendation,” Bill says. If you’d like to know more about the FUMCFW Master Plan, please watch the full presentation of the project that was made to the congregation last February. If you have questions or want to know how you can get involved in helping this exciting First Church vision become a reality, please contact Barry Hudson (BHudson@dunawayassociates.com).